What imagery has come to define political life in Japan after the Fukushima nuclear catastrophe? 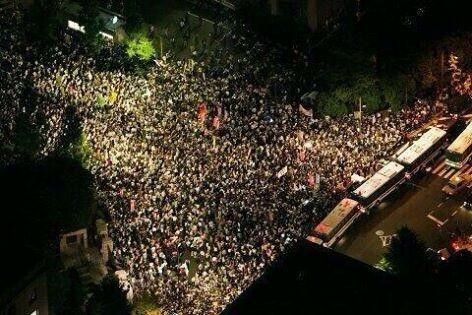 In the summer of 2012, a few hundred protesters gathering weekly “in front of the prime minister’s office (Kantei-mae)” grew into hundreds of thousands. Every Friday evening, the crowd manifested itself, pouring silently out of subway exits and municipal buses, politely dodging riot police and right-wing mobs, only to disperse obediently after exactly two hours of rhythmic chanting. Within this limited time-space, repertoires of collective performance emerged through participants’ assiduous negotiation with the semiotic void between propriety and righteous indignation. One contagious slogan resonating through the crowd: Saikadō hantai! “Against restarting” the 50-or-so reactors put on emergency hiatus after a magnitude 9 earthquake struck eastern Japan on March 11, 2011, triggering 130-feet tsunami waves that obliterated everything in their path as far as six miles inland. Saikadō hantai! Against prime minister Noda and his cabinet, desperate to assert the legitimacy and profitability of the nuclear establishment, itself a cornerstone of the postwar consolidation of political and economic power, even in the midst of escalating nuclear catastrophe. Saikadō hantai! Against the inextricability of state and nuclear power in the nexus of complicity and vested interest known as the nuclear village, and its unstable foldings of everyday social experience and signification into what I call the nuclear state of political life in contemporary Japan. Amidst the emergent complexity of the nuclear aftermath, newly spun threads of affinity cocooned the chanting masses in all-too-familiar narratives of popular legitimacy, far beyond the organizers’ “single-issue” concerns. Increasingly overburdened by significance, this against reverberated throughout a traumatized social consciousness, and—quite literally—throughout the spatial nexus of government authority. The prime minister’s office: straddling the steep hillside behind the Diet building amidst towering government complexes, a stone’s throw from Tokyo Electric (TEPCO) headquarters, had become the symbolic locus of government disaster response. Now, it played reluctant host to a different spectacle. Not since the 1960 protests against the renewed US-Japan Security Treaty (Ampo) that brought hundreds of thousands out into the streets had the sterile parade grounds yielded to such a crowd. 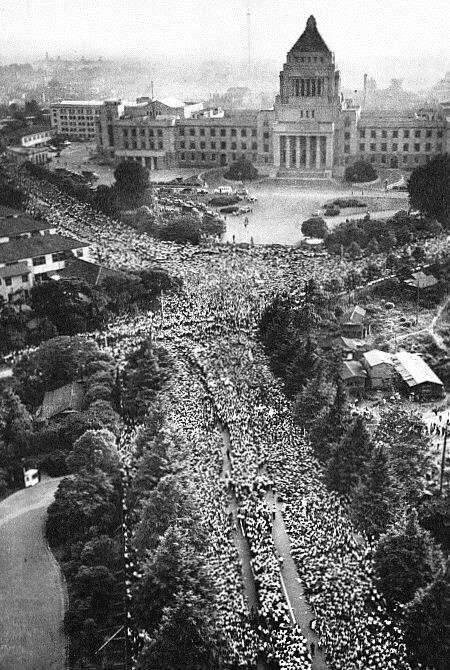 Below a byline declaring “‘ordinary people’ in protest,” the Asahi evening news declared that “after a 52 long years, the citizen demonstration has returned,” invoking haunting images of another crowd, different but the same, flooding the same spaces of state power in eternal recurrence. As weekly participation peaked at 200,000 in June 2012, pundits proclaimed the unprecedented turnout a new paradigm of citizen expressivity; an “age of demonstration” soon dubbed the Hydrangea Revolution after the blooming flowerbeds encircling the crowds at the protest site. Surveys showed that a majority of participants demonstrated here for the first time, mobilized through online counterpublics with millions more spectating. Reifying itself as the “tip of the iceberg”—a signifier of larger, latent processes of social change—the crowd was in turn wielded as pliable instrument for other causes. The organizers themselves seized on this imagery of popular discontent, mobilizing a populist imagery of the people manifesting itself in defiance of illegitimate representation by state and capital. But PM Noda remained undeterred, dismissing the spectacle as nothing but “loud noise.” In an interview, former PM Hatoyama Yukio—one of many politicians who opportunistically sought to associate themselves with the Kantei-mae crowd—cautioned his successor not to “underestimate this people’s power.” “When I was inside the office,” Hatoyama assured, “I could hear the chanting … I think it’s an issue of whether [Noda] is listening or not.” Soon, Noda pledged his “careful attention” not to the irreverent crowd, but to the “voiceless voices” of ordinary people whose silence, at least to Noda, signaled their support for restarting the reactors. In invoking the same silent majority by which Nixon had dismissed the civil rights movement in 1969, Noda used the exact words by which yet another PM, Kishi Nobusuke (grandfather of current PM Shinzo Abe), had steamrolled the 1960 renewal of the US-Japan security treaty through the Diet during the height of outrage against U.S. imperialism. 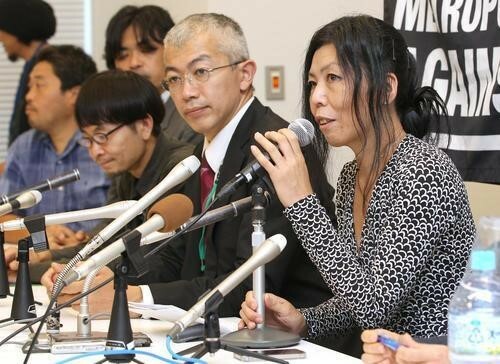 Thus the news that Noda had agreed to host a delegation of 10 representatives of the weekly assembly of protesters shocked both conservative mass media and the political establishment. Despite thorough lampooning of the elected 10 in conservative media rags, Noda’s invitation in effect consecrated the Kantei-mae crowd as a legitimate incarnation of popular discontent with the state’s post-disaster recovery and policy measures. Today, we really wanted to come here together with the many, the many hundreds of thousands of people outside, but because of the location [inside the Kantei, this is not possible.] I hope that someday you will listen (…) to the voice of the people. As invoked by Redwolf and others, the figure of the crowd takes on almost mythical properties. Framed in terms of the simultaneously omnipresent gaze and missing voice of the people, it transcends all spatiotemporal boundaries: at once outside and within, present and absent—as if the image of the people can be as fully incarnated by the ten present inside as by the tens or hundreds of thousands absent outside, and the millions asserted to be participating digitally. How could the Kantei-mae assembly lay claim to the embodiment of a general will? The crowd was gone. But in spite of its deafening absence, its envoys resorted to the crowd as a figure of populist legitimacy. 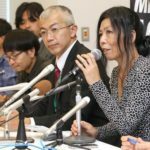 If images of a seemingly endless mass of people, thronging at impenetrable monuments of state power, have now become emblematic of the crisis of political representation gripping Japanese society, this simultaneous presence and absence needs to be accounted for by any serious study of political action, affect and legitimacy in the long nuclear aftermath. This is the fourth report of an article series on the social movements that are currently occurring in Japan. Love Kindstrand is a doctoral student in the Department of Anthropology at the University of Chicago, who is interested in the legacies and legitimacies of social activism in postwar Japan.